MGA lost one court case against him in his career. It is the case of MGA vs. Karam ud Din. I have collected some bits and pieces of info here. In January 1903, on behalf of Moulvi Karam Deen of Bheen District Jhelum, and Moulvi Faqeer Mohammad, Editor of Sirajul Akhbaar Jhelum, Hadhrat Sheikh Yaqoob Ali Editor of Al Hakam and Hadhrat Hakeem Fazal-ud-Deen of Bhera who were being sued in connection with a booklet, ‘Saif Chishtian’ by Peer Mehar Ali who was custodian of the Goalrah Shrine. On Oct-16th, 1903, MGA left Qadian for Gurdaspur (see NOV/DEC-1903—ROR). MGA and Hakeem Fazal Din lost this case in 1904 (exact date unknown), and were about to be thrown in jail, however, they made bail (700 rupees) and were released. About a year later, they won on appeal in early 1905. It was a Judge european Judge named Mr. Hurry, he was the sessions judge of Amritsar. This prayer is an amulet and protection… I will henceforth make this supplication regularly in my Prayers, and you should also do it. The greatest matter in it, which teaches the True Unity—that is, assures that Allah the Glorious alone can cause any harm or impart any benefit—is that it teaches us that [O Allah] everything is in Your service, and no harmful thing can cause any damage without Your will and permission. It was conveyed to me that this is the great name of God and that whoever supplicates in these terms would be delivered from every affliction. [al-Badr, vol. 1, no. 7, December 12, 1902, p. 54 and al-Hakam, vol. 6, no. 44, December 10, 1902, p. 10]. (B) Of the Signs shown in my favour is one in which God, the All-Knowing and the Wise, informed me about a mean person and his great calumny against me and apprised me through His revelation that this man would attack me in order to humiliate me, but would himself become my target in the end. Allah the Almighty conveyed this to me in the course of three dreams. He disclosed to me in a dream that this enemy of mine would engage three helpers in my opposition to achieve success in his proceedings to dishonour me and to put me to trouble. I was shown in a dream that I was hauled into court like a prisoner but I was shown that I would be delivered in the end, though after an interval. I was also given the good news that the affliction would be reverted upon this lying mean enemy of mine himself.…. Then I began to wait for the developments as indicated in the prophecy. After the passing of a year, all this happened at the instance of Karam Din. (That is, he brought unjustified criminal charges against me).639 [Haqiqatul-Wahi, p. 215, Ruhani Khaza’in, vol. 22, p. 225]. Ahmad, you are My purpose and are with Me. You are with Me and I am with you. Your secret is My secret. When you are angry, I am angry and everyone you love, I love. You have a high standing in My Presence. I have chosen you for Myself. [Publishers]. While in Lahore I received, repeatedly, the revelation: That is [Arabic] I shall show you My blessings from every side.658 [al-Hakam, vol. 7, no. 4, January 31, 1903, p. 15 and al-Badr, vol. 2, no. 1–2, January 23–30, 1903, p. 9]. 658-–This prophecy was fulfilled in this wise* that when I approached Jhelum about ten thousand people came to see me. The road was choked with people in all sorts of humble attitudes as if they wanted to prostrate themselves. Then there was such a multitude of people around the District Courts that the Magistrates were greatly surprised. Eleven hundred men and two hundred women made the bai‘at and joined the Jama‘at. Karam Din’s complaint against me was dismissed. Many people made offerings and presented gifts out of good will and humility. Thus we returned to Qadian enriched in every way with God’s blessings and God fulfilled the prophecy very clearly. [Haqiqatul-Wahi, p. 252, Ruhani Khaza’in, vol. 22, p. 264]. I was made to understand that of the two sides God will be with those and will bestow help and victory upon those, who are righteous—that is to say, who do not tell lies, do not wrong anyone, do not calumniate anyone, do not persecute people by cheating, deceiving, and dishonest dealing, and eschew every vice and adhere to truth and justice. And fearing God, they treat His servants with sympathy, goodwill and goodness, and are true wellwishers of mankind. They are not inspired by beastliness, wrongdoing and evil, and are ever ready to behave virtuously towards everyone. The final decision will be in their favour. At that time those who ask: ‘which of the two sides is in the right’ will be shown not one Sign but many Signs. [al-Badr, vol. 2, no. 24, July 3, 1903, p. 189 and al-Hakam, vol. 7, no. 24, June 30, 1903, p. 11]. concerning your status. ]… Thereafter when we appeared in court, the other side’s lawyer asked me the same question: Is your rank and status as you have described it in Tiryaqul-Qulub? I answered: Yes, by Allah’s grace that is my status; Allah has Himself bestowed it upon me. I had taken up a pen to write. I observed that its point was broken. Thereupon I said: Put on to it one of the nibs that had been sent by Muhammad Afdal. While those nibs were being looked for, I woke up…. If someone would take the time out from worldly occupations and stay with me, he would witness a running river of prophecies being fulfilled like the one of yesterday concerning a pen.740[al-Badr, vol. 2, no. 37, October 2, 1903, p. 390]. conveyed to His apostle on the 22nd in the evening and which he had narrated on the morning of the 23rd were fulfilled. [al-Badr, vol. 2, no. 37, October 2, 1903, p. 390]. 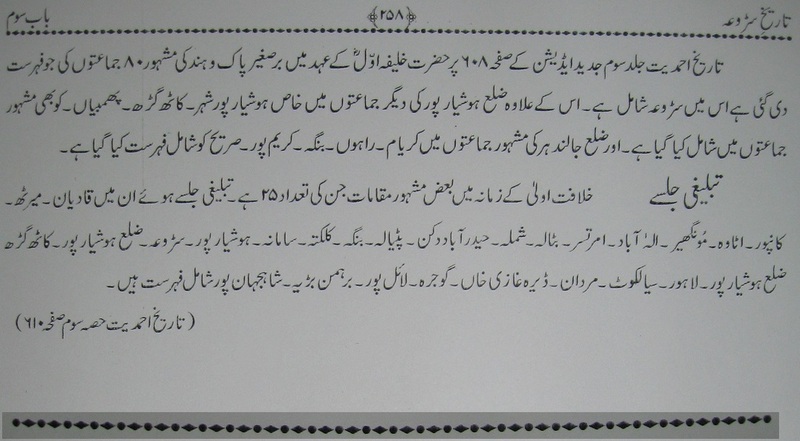 Note by Hadrat Maulana Jalal-ud-Din Shamsra: This revelation was received during the court case of Karam Din. deserving of even stronger words. [Haqiqatul-Wahi, p. 380, Ruhani Khaza’in, vol. 22, p. 394]. Footnote—Note by Hadrat Maulana Jalal-ud-Din Shamsra: This revelation was received on the return from Gurdaspur where the Promised Messiahas had gone in connection with the case of Karam Din. (See al-Hakam, May 24, 1904, p. 2). Jama‘at825. It so happened that within 20 or 25 days he lost two sons. In the end, though he had laid the foundation in his judgment of sentencing me to imprisonment, God held him back from that design, yet he imposed upon me a fine of 700 rupees. I was then honourably acquitted on appeal by the Divisional Judge. But Karam Din’s conviction and sentence were maintained. My fine was remitted but Atma Ram’s sons did not come back…. According to the Divine prophecy which had been published already in my book Mawahibur-Rahman, I was acquitted, my fine was refunded, and the issuing officer’s [Atma Ram’s] order was set aside and he was rebuked for issuing an improper order. But Karam Din (as I had already published in Mawahibur- Rahman) was convicted and punished and the judgment of the court confirmed his being a liar. [Haqiqatul-Wahi, pp. 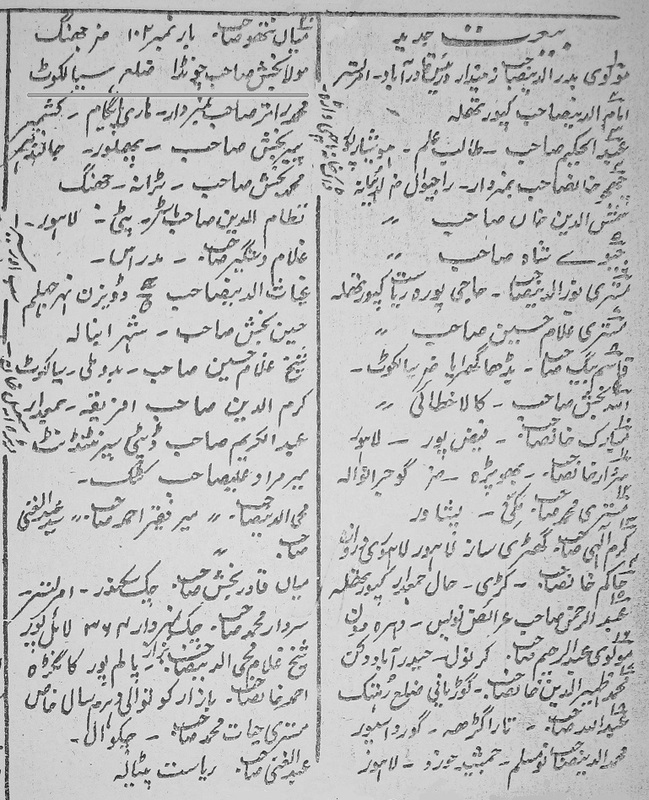 121–122, Ruhani Khaza’in, vol. 22, pp. 124–125]. The Promised Messiahas saw in a dream that a lion has taken away both sons of Atma Ram. At the same time as the Promised Messiahas narrated this dream, Atma Ram received a telegram that his son is suffering from plague. Two sons of his died one after the other with plague. [Zuhur-e-Ahmad Mau‘ud, pp. 51–52]. 1261–Note by Hadrat Maulana Jalal-ud-Din Shamsra: He was from Ludhiana and was a cobbler by profession. He used to make shoes for the Promised Messiahas. He stated that he stayed with the Promised Messiahas in Gurdaspur during Karam Din’s trial. The Promised Messiahas said at the time of ‘Asr Prayer one day before judgment was to be delivered in the case of Karam Din… that he had seen in his dream that he was returning home riding a white horse and his wife said (something like): We have suffered a loss (probably of money). The Promised Messiahas said to her: That does not matter as I have returned safe. secure against the mischief of the Magistrate. That is exactly what happened the next day; he was sentenced to a fine, which was immediately paid … and on appeal [he was acquitted and] the fine was remitted. [al-Hakam, vol. 38, no. 3, January 28, 1935, p. 4]. [Urdu] The route via Batala is dangerous. a skirmish… but when they discovered that the Promised Messiahas was not in the chariot, they apologised for the assault. [Register Riwayat-e-Sahabah, vol. 10, pp. 280–281]. eleven hundred people came to me for bai‘at and about two hundred of them were women. The case filed by Maulavi Karam Din was dismissed and a large number of people made offerings in cash and kinds to show their regard and respect for me. And this was how I was showered with the Divine blessings and returned to Qadian victoriously. (Haqiqatul-Wahi, p. 252, Sign No. 101, Ruhani Khaza’in, vol. 22, pp. 263-264). Ahmad by A.R. Dardra, edition of 2008, pp. 412-413). Life of Ahmad by A.R. Dardra, edition of 2008, page 564. Qadian in 1895. It was named Diya’ul Islam. 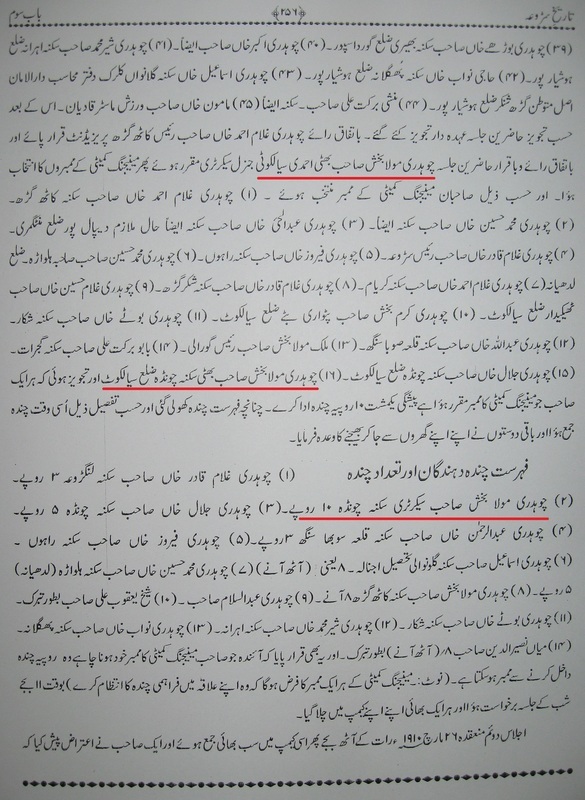 This press produced Ahmad’sas publications at cost price (Ahmad’sas statement in Karam Din’s case, Section 420. I.P.C. dated. 19.8.1903). It was for this reason that Ahmadas produced, on 15.8.1898 a detailed account of this press in the income tax case. (See statement of Hakim Fadl Din in Karam Din’s case on 20.7.1903). Anyone who denies the truthfulness of a Prophet is a great liar. 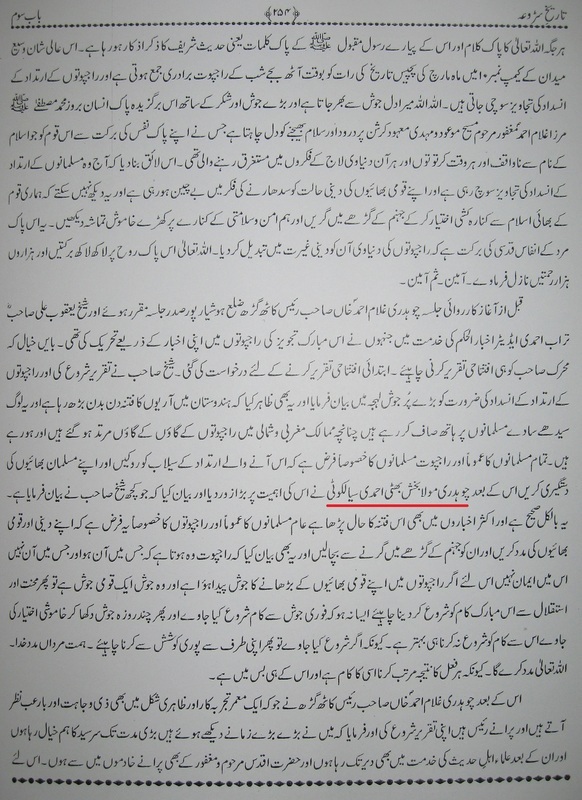 Mirza Sahib has claimed to be a Nabi. His followers believe him to be true in this claim and his opponents consider him false. The Holy Prophetsa is true according to Muslims and false according to the Christians. 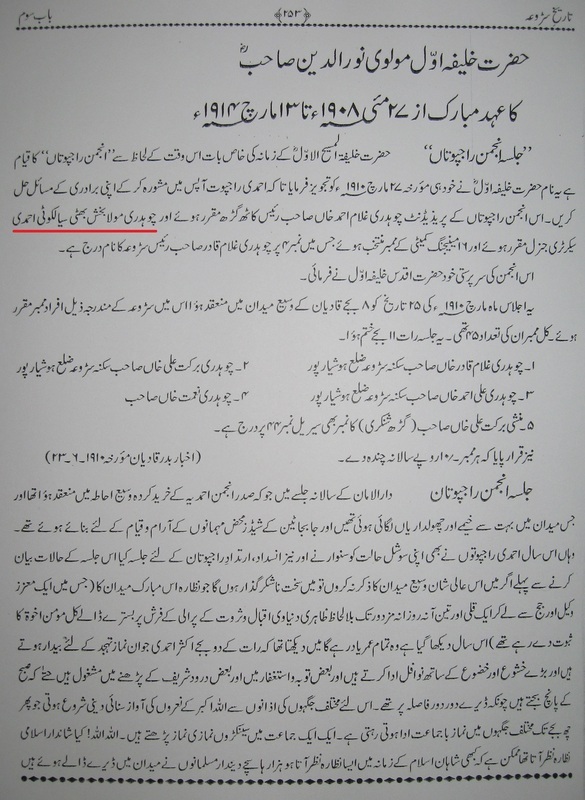 Mirza Sahib makes a claim of nubuwwat in his writings. The purport of his claim is that, “I am a Nabi but I have brought no new shari‘ah.” According to the Holy Qur’an anyone who treats such a true claimant as a liar is a great liar. (Court Proceedings, p. 362). There is another view of the matter according to Mohamedan theology. One who belies a person claiming to be a Prophet is a kadhdhab [great liar] and this has been admitted by prosecution evidence. Now the complainant knew perfectly well that the first accused claimed that position and, notwithstanding that, he belied the accused. Consequently in religious terminology the complainant was a kadhdhab. (Proceedings Gurdaspur Court, p. 194). Explaining the use of relevant quotes from other authorities, the Promised Messiahas stated that these quotes do not constitute plagiarism, otherwise everyone will be exposed to this charge. 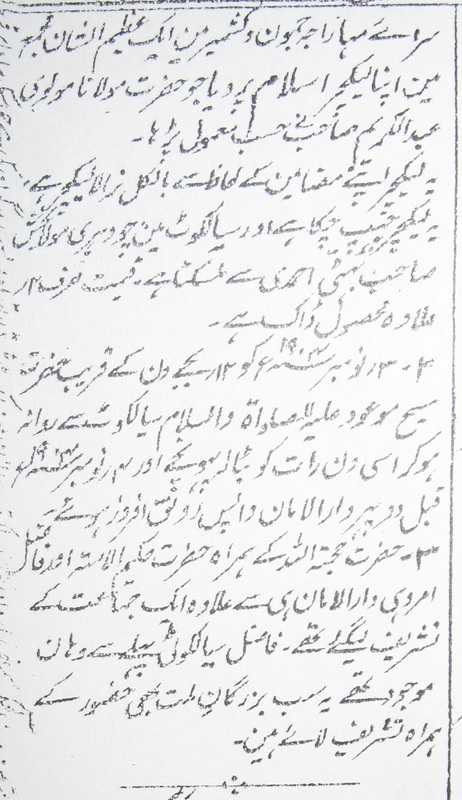 It so happened that Mian Shahabuddin and Maulavi Karam Din in their correspondence with the Promised Messiahas mentioned that most of the material appearing in Saif-e-Chishtiya’i written by Pir Mehar ‘Ali Shah is copied word by word from the notes of Maulavi Muhammad Hasan Faidi and these notes were written by him on the margins of the books I‘jazul-Masih and Shamse Bazighah and these books carrying marginal notes were bought. This is how the devious Pir was exposed who made the allegations that the Promised Messiahas had plagiarized whereas the same charge recoiled on him. Muhammad Hasan Faidi which the Maulavi had written marginally on the I‘jazul-Masih and Shamse Bazighah by Hadrat Maulavi Muhammad Ahsan Amrohi. This information was given by Mian Shahabuddin and Maulavi Karam Din in their letters to the Promised Messiahas. This whole correspondence has also been published in this book. Therefore, when the appeal was filed in the court of the Divisional Judge, he, in his God-given shrewdness, at once got to the bottom of the case and noted in the judgement that whatever I had written about Karam Din was absolutely correct and I had full right to do so. The judgement he passed has since been published. In the end, he acquitted me of the charge and ordered the refund of the fine. He also censured the trial court for letting the case linger so long. The entire affairs are being carried out to my favour? Then not only this that it has happened once, I see the bounties of God at each step. That God Who was supposed to befriend the believers. Who aggressively attacked mefor no reason. God’s revelation repeatedly gave glad tiding of victory. Then, after retribution, he decked himself with eye salve. MGA gives lots of revelations claiming that his enemies will be defeated. MGA also claimed to have seen Gabriel for the first time ever. Ruhani Khuzain is an attempt at editing the writings of MGA and his team. Its heavily edited, the original books have been checked by our team and we have seen many issues. In the below, we have given the breakdown of what books fall into whichever category of RK. Originally written in Arabic, Persian and Urdu. New Computerized Edition Published in 23 Volumes. Tadhkirat-ush-Shahadatain, Seerat-ul-Abdal, Lecture Lahore, Islam (Lecture Sialkot), Lecture Ludhiana, Al-Wasiyat, Chashma Masihi, Tajalliyyat-i-Ilahiyyah, Qadian-ke-Ariya Aur Hum, Ahmadi or Ghair Ahmadi Main Kia Faraq Hay? This book is part of the controversy between MGA and Pir Mehr Ali Shah. This book played a major role in MGA’s famous court case of 1904 vs. Maulvi Karam Din. Syed Abdul Latif went to Qadian and lived in the company of MGA for 6 months. This is very strange, it is possible that he was working directly for the British government. He even came into contact with an Arab who was also visiting Qadian. Towards the end of 1902, MGA was summoned to Jhelum in connection with the Karam Din defamation case. Syed Abdul Latif traveled with MGA to Jhelum to assist MGA in his court case. Syed Abdul Latif was put to death by the Afghan government on July 14th, 1903. Syed Abdul Latif was imprisoned for 4 months (See RoR-english, Nov/Dec 1903 edition) . Which means that he left Qadian roughly March 1903. “”Sahibzada Abdul Latif left behind good example, if examined carefully his incident is greater than the incident of Hazrat Imam Hussian a.s. because Imam Hussain a.s. Was neither imprisoned nor chained it was only a war where Imam Hussain had an army and if His men were killed, the army of Imam Hussain killed the soldiers of other side as well. Contrary to that Molvi Abdul Latif sb was imprisoned with chained hands and feet. There was no chance of escape for him. The martyrdom of Molvi Abdul Latif is such a great martyrdom that it has no other example in 13 centuries of Islamic history””. My team and I have found a rare book on Ahmadiyya. Its called “The Promised Messiah” by Mirza Mubarak Ahmad, who was one of the oldest sons of Mirza Basheer-uddin Mahmud Ahmad. Not to be confused with other Mirza Mubarak Ahmad, who would have been his uncle, instead he died in 1907. This book came from a speech that Mirza Mubarak Ahmad delivered as an address on 22nd October 1968 to the 19th Annual gathering of Indonesian Ahmadis at Jakarta. He also wrote “Our Foreign Missions” (1957) which explains the spread of Ahmadiyya in the world. 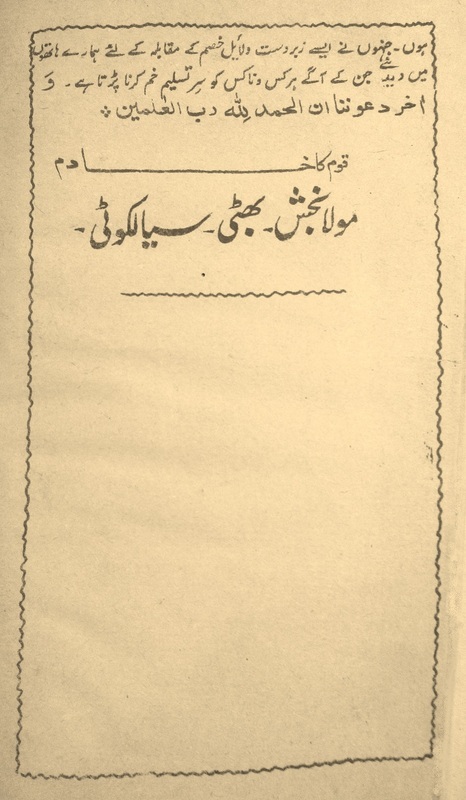 making Barahin-i-Ahmadiyya, issued in four volumes. to raise man to moral, intellectual and spiritual perfection. Successor of the Promised Messiah. and Malaysia as well as Indonesia. and spiritual excellences and of his piety and righteousness. panions of the Promised Messiah, peace be on him. who had also the honour of being his brother-in-law. grace also, which attracted the hearts of those who saw him. radiate from the face of an impostor. playing on it. His eyes habitually remained half-closed. or too much attention to it was alien to his dignified bearing. the strongest link between the Creator and His creatures. I liked.' " (Siratul Mahdi). "Is not Allah sufficient for His servant?" (Tazkirah). not possible to count them — (Kitabul Bariyya). Allah, whole families are being entertained at my table." and nearness to Him, nothing else had any significance at all. way that leads to Thee is far above reasoning and intellect. worlds together are as nothing". (Chashma-i-Masihi). even as a small child rejoices at the sight of its mother. "I esteem thee as I esteem My Unity and My Singleness. bless thee with My Eternal Companionship. and God's love for the Promised Messiah, peace be on him. and to nourish it with the water of Divine love. Next to his love for God, came his love for His Prophet. In this case also, the Promised Messiah's love is unparalleled. and the Pride of creation,"
fearful of thy death alone." centuries earlier, his eyes overflowed with tears. possibility of performing the Pilgrimage should be considered. peace and blessings of Allah be on him." hammad, my soul yearns to lay itself down for thee." Master, I am the meanest of thy servants. possessed the power of flight." our Holy Prophet, peace and blessings of Allah be on him. Messiah did not respond as if he had not noticed him. was involved, he was uncompromising. the Holy Prophet, peace and blessings of Allah be on him. scurrilous remarks on your Beloved Master?" and blessings of Allah be on him. "Surely, thou dost possess the Most Excellent Morals. "Imbue yourselves with Divine Attributes." weeping at the Divine Threshold like a woman in travail. him. Of course, if he himself cuts asunder, I am helpless. dared not even to lift his eyes to face the Promised Messiah." significance in the eyes of the Promised Messiah himself. It so happened that the sheets were mislaid by Maulvi Sahib. the press man is waiting for material, it is getting late. even better than I had written in those two sheets.' "
peace be on him, set a splendid example in this respect also. of drinking milk at night, so I have brought it for you. wonderful demonstration of kindness and affection! sitting in his room; some guests also were sitting with him. Allah be on him, exhorted us to honour our guests." by Hazrat Munshi Zafar Ahmad Sahib of Kapurthala. classes sat together with him like the members of a family. pied a lower seat while a disciple occupied a higher one. in his stomach, and was much worried, despairing of life. entertaining extreme religious and communal prejudice. of protection and security for him." 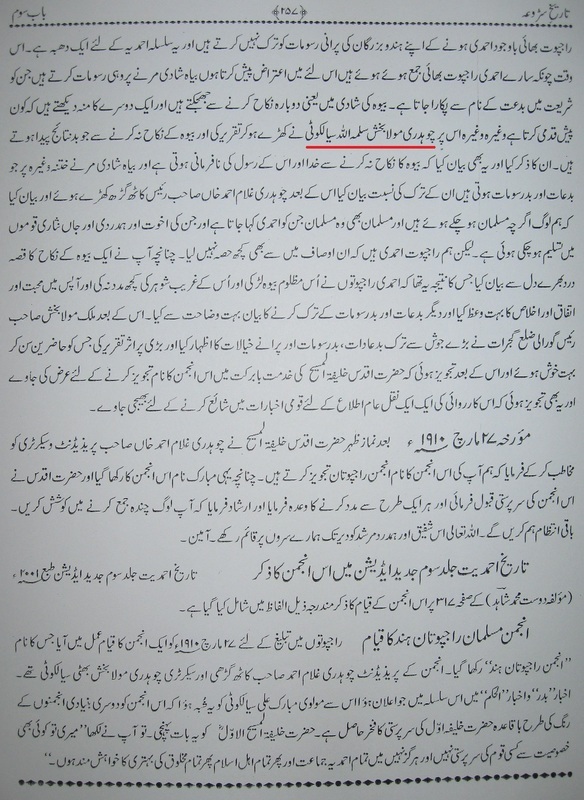 non-Ahmadi Muslim antagonists of the Promised Messiah. case is pending in heaven." and blessings of Allah be on him, expired. appreciate Him because He can help you at every step. Follow not those who depend entirely on worldly means. achieved by means of prayer. Our only weapon is prayer. Promised Messiah, peace be on him, to help with his prayers. build a new mosque too, and I will decide accordingly." complete course of treatment there, he returned to Qadian. grace, made a complete recovery and lived to a good old age. Ahmadi friend, Munshi Ataullah Patwari, reported it to me. "You claim to be the Promised Messiah and Friend of God. of which he has mentioned in his book, Haqiqatul Wahi. way of illustration, she mentioned one more such incident. eyes. She had undergone much treatment, but to no effect. inflamed eyes, although I am now an old woman of seventy." shone forth like the bright rays of the sun. of respect for the faith and of his majestic sense of dignity. observed, "Whoever he may be, he shall be humiliated." same words : "Whoever he might be, he would be humiliated." help and protection being extended to him. thrown into the fire, it became cool under Divine Command. if God made the fire cool for His Beloved Servant, Abraham. for me, and God will save me from its harmful effects." Promised Messiah, peace be on him, did not worry at all. even scanning them carefully, and had yet found the reference. was at that time busy writing his book Nurul-Quran. wear gold and silver bracelets on their wrists for ornament. shall not be so. The Divine Kingdom has its own designs. the time for Prayer, and there was no one in the Mosque. on him, at Ludhiana, he stayed on there for some time. first mentioned testifies to this truth. Nuruddin was the first to make the covenant of initiation. worded the telegram as, "Come to Delhi without delay." his Imam without any delay the following morning. There was a simple villager, Baba Karim Bakhsh by name. him, had gone to Gurdaspur in connection with a law suit. I should fail to hear him, and it should cause him trouble. a happy mood, 'What a great blessing of God is upon me! Promised Messiah, peace be on him. to write and publish a book on the Ahmadiyya Movement. into the house of the Promised Messiah, peace be on him. Masih II, Munshi Sahib broke down and sobbed bitterly. Messiah, peace be on him, entertained for him. that time. I entered the closet and started massaging him. and success shall be accompanied by mighty Signs'." of the truth of this Revelation. relate this dream to your mother.' "
Sahib would be his First Successor. itle of "Sultanul-Qalam" (Master of the Pen). bless it, otherwise, He may cause it to be abandoned. topics formulated by the Conveners of the Conference. Companions of the Promised Messiah, peace be on him. other papers that may be read in the Conference. Jewish tribes of Khaibar, and their banners will be lowered. and praise the beauty and excellence of the paper. constrained to accept Islam tomorrow, if not today." Islam spread into all corners of the earth. .
blessed mysteries for the wise." having enveloped it, had illuminated and made it lustrous. and absorption in the Divinity, is beyond human power." ull of Divine signs, miracles, Divine help and blessings. hearts were washed clean automatically. drought, and made the earth green and verdant." he desired to see his Community invested. presumptive evidence, lead us astray from the right path. belongs to Allah, Lord of the Worlds. We are sure that Ahmadiyya trolls and other Ahmadiyya INC employees will get this website removed shortly. We have thus copied and pasted all of its data on this very blog. This blog/website seems to have created by some Ahmadi’s, most likely a relative of Chaudhry Maula Bakhsh Sahib Bhatti Sialkoti, who was a close companion of MGA. This website is a dedication to Major Dr. M. Shah Nawaz Khan (1899–1977), who is the son of Chaudhry Maula Bakhsh Sahib Bhatti Sialkoti. died on November 2, 1916. He was a sincere, courageous and a passionate preacher. He made a plaque for the Minarat-ul-Masih for huge sums of money. He published two books: 1. Efham-ul-Khaseem ma’a Ikhtibar-e-Ibrahim, 2. Ahmad Rasool. Dr. Mohammad Shah Nawaz Khan sahib(Retired Major and Medical Missionary to Sierra Leone) was his son. (4) Dr. Mirza Yaqoob Baig, (5) Hadhrat Mirza Niaz Baig Kalanvi. Aajiz: Khadim Maula Bakhsh Bhatti Ahmadi, Sakin Chawinda, Haal Reader, District Sialkot. Foundation laying ceremony of Minaratul-Masih on Friday, March 13, 1903. Ch. Maula Bakhsh sahib presented the marble plaque to the Promised Messiah (AS). Hayat-e-Qudsi, Vol. 3, page 27.
from the train to the carriage outside the Jhelum railway station. for his court appearance in a false case. Chaudhry Muhammad Ahsan Sahib (RA). Narrated by Hadhrat Mian Abdur Razzaq sahib Sialkoti (RA). Hadhrat Mirza Shareef Ahmad sahib (RA), the grandfather of Hadhrat Mirza Masroor Ahmad Sahib, Khalifatul Masih V is in Promised Messiah’s lap. (4) Hadhrat Shiekh Nur Ahmad (Owner of Riaz-e-Hind Press, Amratsir), (5) Mistry Faiz Ahmad of Jammu. (4) Hadhrat Pir Manzoor Muhammad, (5) Hadhrat Hakim Fazl Din Bhervi. Sitting on Floor: (1) Hadhrat Hakim Shamsudin Sialkoti, (2) A relative of Pir Sirajul Haq Naumani, (3) Hadhrat Pir Sirajul Haq Naumani, (4) Muhammad Yaqoob s/o Hakim Muhammd Hussain of Lahore, (5) Hadhrat Hakim Muhammad Hussain of Lahore. Al-Fazl July 21, 1950, Vol. 4, No. 168, page 6 column 4. She expired on January 25, 1950 at 8 pm in Sialkot. She was buried in the the graveyard of Imam Sahib. Her tombstone was placed in “Bahishti Maqbara, Qadian”May the mother and the daughter rest in eternal peace. The above announcement was published under the title “Mutafarrak Baatain” by the editor Al-Hakam, Hadhrat Sheikh Yaqoob Ali Turaab sahib (The First Historian of Ahmadiyyat). Al-Hakam May 31, 1905, Vol. 9, No. 19, page 7, column 4. The previous Friday from the date of publication, turns out to be the May 26th, 1905 when the funeral prayers were offered. The above photograph is the first page and right upper is the second page of the letter while the right lower is thePromised Messiah’s response to the question about the QASR PRAYER, on the reverse side of the second page. The Promised Messiah’s (AS) response. On the back side of the letter, The Promised Messiah (AS) inquires about the names of the cities in the East and North of Punjab according to the map. The Promised Messiah’s stroll on Dec. 28, 1907.
the meeting of Hazoor with everyone. 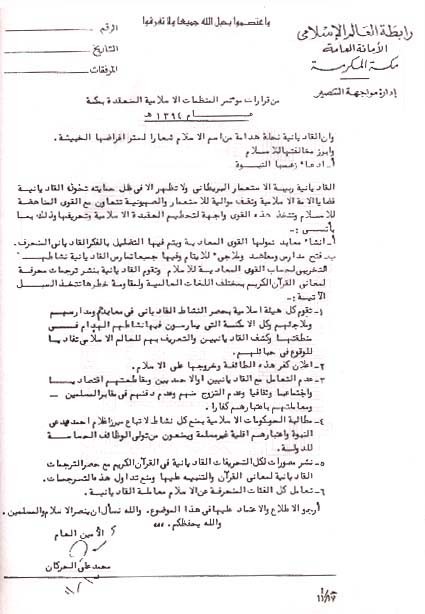 two corrections can be made to the future editions of Tadhkira. (1). Bimaar bohat hi cheekhain maarti hey instead of Bimaar bohat hi cheekhain maarta hey. (2). Rehmat aur Fazl ka makaam – Shukr ka makaam instead of Rehmat aur Fazl ka kalaam – Shukr ka kalaam. due to the extra workload in the month of December. He intends to send an amount equal to his travel and other expences between Qadian and Sialkot so that it becomes an incentive for others to follow who may be in similar situations like his. At that time the total travel cost for return visit to Qadian from Sialkot was Rs. 3. Instead, Ch. Maula Bakhsh sahib donated Rs. 10 to a special fund before the start of the Jalsa. He also advised his friends to dedicate Re. 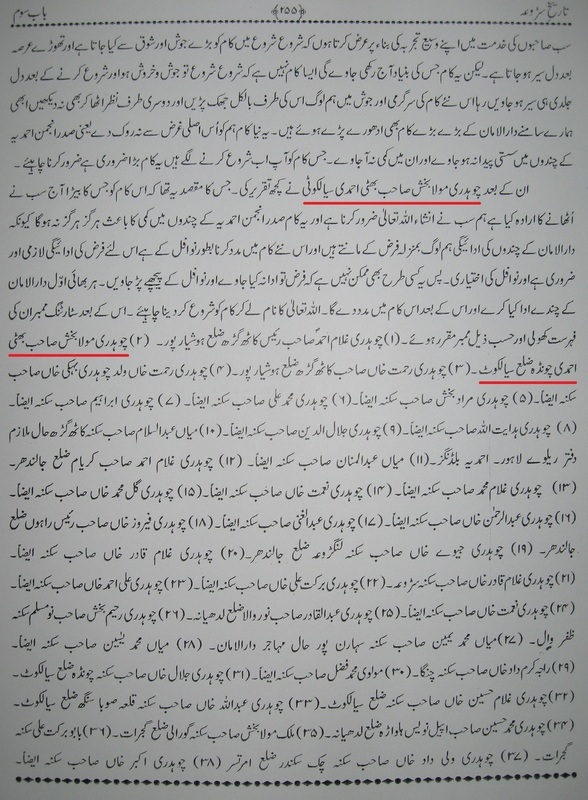 1 as “Nazrana” in favour of Hadhrat Khalifatul Masih. to the cause of uplifting Rajputs from their decadence. Al-Hakam Jan. 21, 1910, No. 2, Vol. 14, Page 6, Column 3. Ch. Maula Bakhsh sahib Bhatti Sialkoti was its secretary. at the two day Jalsa from morning till night. This was a written debate between Ch. Maula Bakhsh sahib and Sh. Maula Bakhsh sahib to be later adjudicated by the Poet-Philosopher of the East, Dr. Muhammad Iqbal but Sh. Maula Bakhsh sahib could not compile his arguments in time, hence Ch. Maula Bakhsh sahib published his arguments for everyone to judge for themselves. The Funeral Prayers for Ch. Maula Bakhsh sahib were offered five times on Friday the 3rd of Nov. 1916 at the Masjid Kabootran wali, Sialkot. which Ch. sahib very happily did. When Hadhrat Musleh Maud was explaining his dream he told the audience about Ch. Maula Bakhsh as father of Dr. Major Shah Nawaz sahib. Ch. Maula Bakhsh sahib had died almost 30 years before this dream while Dr. Shah Nawaz Khan sahib was serving in Japan as a Captain. Hence it became a prophecy for him to be promoted to Major in future. by Ch. Maula Bakhsh sahib to inquire from the Promised Messiah (AS) about the issue of offering the jinaza prayer of a non‐Ahmadi Muslim. Dr. Shah Nawaz Khan found this letter in his father’s documents. On the instructions of Hadhrat Musleh Maud (RA), he submitted the original letter after copying its contents to Hadhrat Mirza Bashir Ahmad sahib M.A. (RA) to be permanently preserved in the archives of Ahmadiyyat. The Promised Messiah (AS) sent his response along with the original letter . In 1974, the World Muslim League met at Mecca, Arabia and told the world that Ahmadiyya was not to be trusted. King Faisal was heavily involved, his murder as few years later was hailed by Ahmadi’s as a sign from their God.